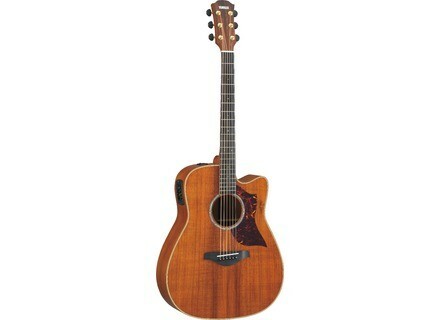 A4K, Acoustic-electric Folk/Western guitar from Yamaha in the A series. Product replaced by the Yamaha A4K 2018. Yamaha will launch this year the A4K and AC4K limited edition A series electric-acoustic with koa body equipped with SRT modelling system. The Dreadnought A4K and Concert AC4K are limited editions of the A3 model and will only be available for 150 guitars in the world. Both guitars are equipped with the new Yamaha SRT (Studio Response Technology) modelling system which combines a piezo pickup system with a built-in microphone modeling technique specific to each guitar model. The S.R.T. system lets players choose from three different mic settings (large diaphragm, small diaphragm and ribbon microphones) that can be blended with the piezo pickup. In addition, the S.R.T. system's feedback detector cancels feedback frequencies in live situations. [NAMM] Peavey debuts new Vypyr VIP Series amps Peavey introduces the Vypyr Variable Instrument Performance series that contains Bass guitar, Acoustic guitar and Electric guitar amplifier models. [NAMM] Electro-Harmonix Epitome and 8 Step Program EHX introduces at NAMM 2013 a new multi-effect pedal, the Epitome and the 8 Step Program analog expression/CV sequencer and its Foot Controller. [NAMM][VIDEO] Discover the Bogner Atma amp The Audiofanzine team went to the Bogner booth at NAMM to listen to the new Atma amp and discover its telescope mounting system.